Are we still in a food coma from yesterday or have we resumed binge eating with the Thanksgiving leftovers yet? I'm actually a bigger fan of the leftovers than the actual dinner. After spending a full day whipping up a holiday feast, it's nice to have all of those leftovers to pick through the rest of the weekend and not have to think about cooking again for a few days. 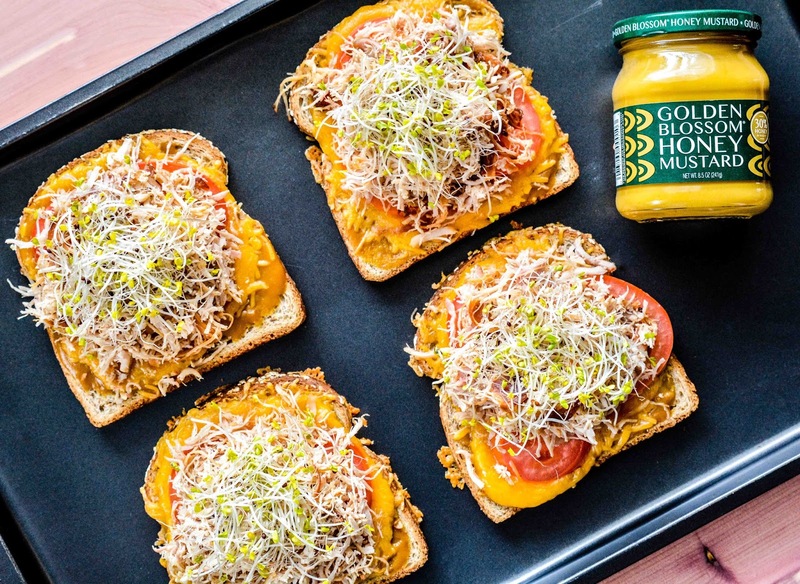 I like to get creative with the odds and ends that have made their way into the fridge, so this year I made Jason some open-faced Turkey & Melted Cheddar Sandwiches from a Golden Blossom Honey Recipe. The only cookware needed is a baking sheet to make a filling and tasty meal. 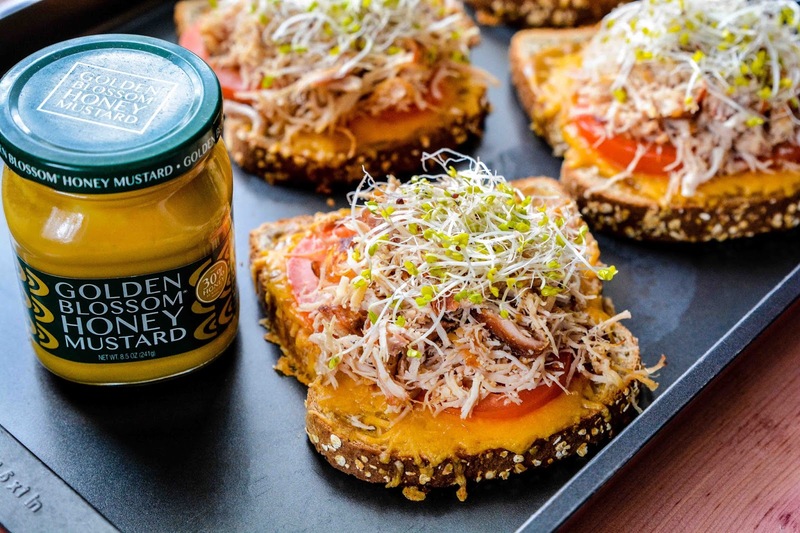 Toasted bread, tangy honey mustard, melted cheddar, plump tomatoes, juicy turkey, and topped with sprouts, this sandwich is anything but boring. Just add in a side salad and some cranberry sauce to keep the Thanksgiving feast going all weekend long. Nom nom nom... hope you had nice holidays yesterday at the in-laws, and hope Mariah came home safely from college! We got her on Monday. It's been wonderful having her home though she did bring a bag of laundry for me to do. The nerve :) She goes back on Monday night, so we will be spending the weekend watching as many family holiday movies as possible before she goes. She got fed alright! On top of Thanksgiving dinner, we cooked every night for her. She's not starving there though. Her meal plan gives her the buffet twice daily and I think she eats better than we do! Plus, I made sure to stock her up on snacks and such when we dropped her off and sent her home with more to replenish her and her roommates food stock for their dorm room. Leftovers sure are a win, no more cooking for a while and less to clean up. Will sure keep you going for the weekend indeed. Gotta love not having to cook all weekend long! Those look so good! One of my favorite parts of Thanksgiving is the leftovers. I can't wait to try this! Om nom nom. This looks amazing and it's definitely something that I would do with the leftover Turkey! Thanks for sharing this recipe, I'd love to make it. That's a great way to use it up! You make great food Theresa! These Leftover Turkey melts looks so delicious! And the sprouts are such a great addition. This is such a good way to use those turkey leftovers! We have quite a bit to use up! Now that's a delicious way to use up some turkey. We didn't have much leftover this year! Mmmm sounds like my kind of sandwich. The Lord knows I have plenty of turkey left to use up. What a great way to use up turkey! I never let mine go to waste. I love to make leftover turkey sandwiches. These look so delicious. I will have to give this recipe a try this weekend. We have a ton of leftovers. This is such an easy way to make an awesome recipe with our leftovers! I do love a turkey sandwich.